This is the kind of dish that evokes strong opinions, at least where I live. There are devoted lovers of menudo, and there are avid haters. (Obviously, I’m of the former group, or I wouldn’t be posting a recipe.) Rarely do I meet someone who is on the fence. When faced with a steaming, spicy, filling, healing stew (some say it’s a hangover cure), with a mountain of tortillas to enjoy alongside, why would anyone despise this dish? Most of the time, it has to do with tripe. Tripe is scary, gross, or otherwise unthinkable to some. It’s not a “normal” cut of meat in my part of the world, so it’s frowned upon and shunned in favor of the fancier cuts. My opinion? That we should cozy up to tripe – give tripe a chance! What is tripe? Tripe is made from the first three chambers of an animal’s stomach (usually beef). The type most commonly found in Latin markets and most commonly used in menudo is honeycomb tripe, which comes from the third chamber. You will most likely find it already thoroughly cleaned, so it will look white, have a honeycomb texture, and should have very little odor to it, if any at all. (Sometimes you might find a grayish version – this type needs to be rinsed well and boiled for a while to remove any grittiness.) The advantages to tripe? If you’re into nose-to-tail eating, tripe will definitely need to be considered. (I’m in favor of sustainable eating. Shouldn’t be throwing away perfectly good parts just because they’re not steaks or roasts. Sometimes, the offal is the true delicacy.) It’s a good, inexpensive source of animal protein – it sells for a fraction of the price of other cuts of beef. Most of the time, all that cleaning is done for you at the butcher, so it is not extremely difficult to prepare. It also adds a lovely textural contrast to soups – simmered long enough, it becomes slightly chewy, but also giving and soft. It is not strongly flavored, and is more apt to take on the flavors added in a recipe than imparting its own. 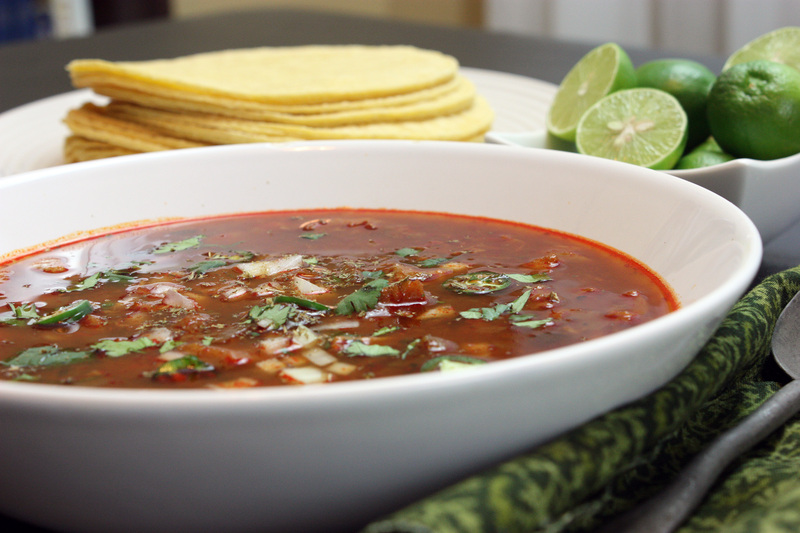 It is a key component in menudo, one of the more popular Mexican soups available. Menudo is traditionally enjoyed for breakfast, often on New Years’ Day, but can be enjoyed on just about any weekend morning. Imagine a large bowl, filled with chili-spiced pork broth, bits of pork and tripe, hominy, laced with lime juice, and garnished with onion, cilantro, and fresh chiles. 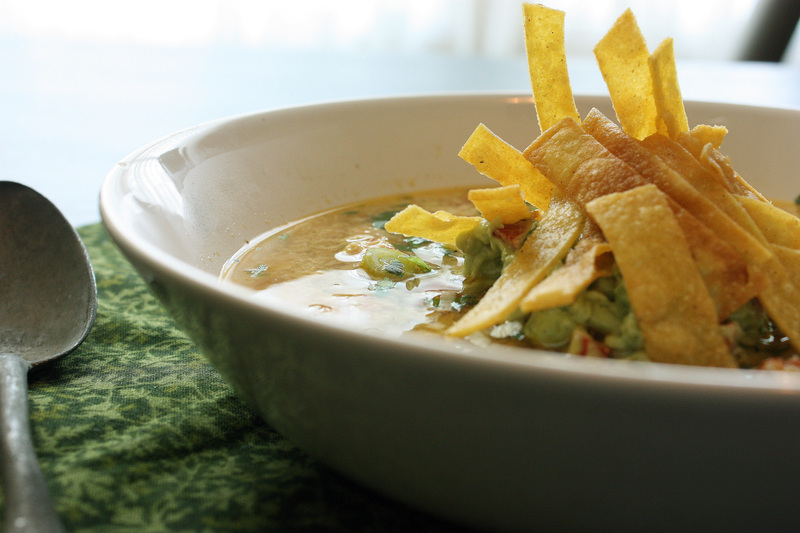 You pick up a fresh corn tortilla, roll it up, and dip a bit in the soup, and enjoy. Spoonful after spoonful opens your weary eyes with a spicy kick, and your whole body warms and is awakened. 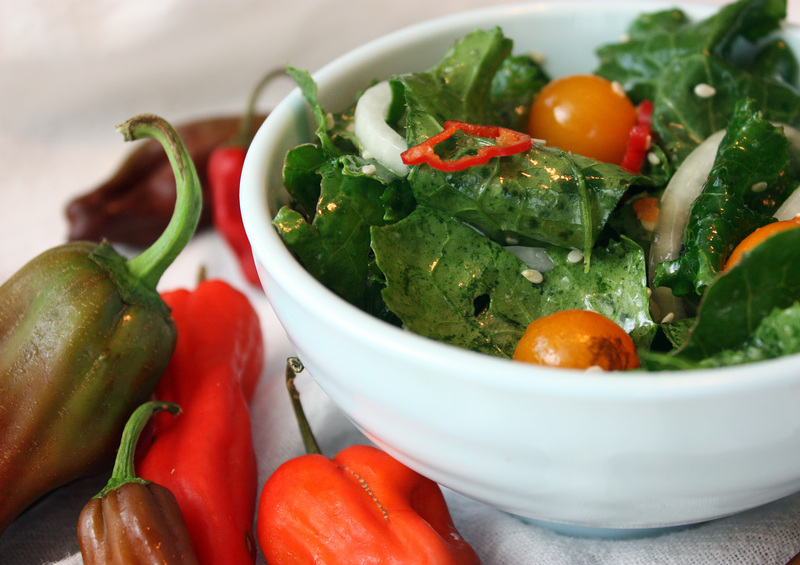 If you’re like me, that heat, complimented by the fresh lime and cilantro, is an addictive, delicious combination. It’s an amazing thing when salty, fiery, meaty, and piquant flavors combine – it’s almost an explosion that knocks you back, but keeps you coming back for more. 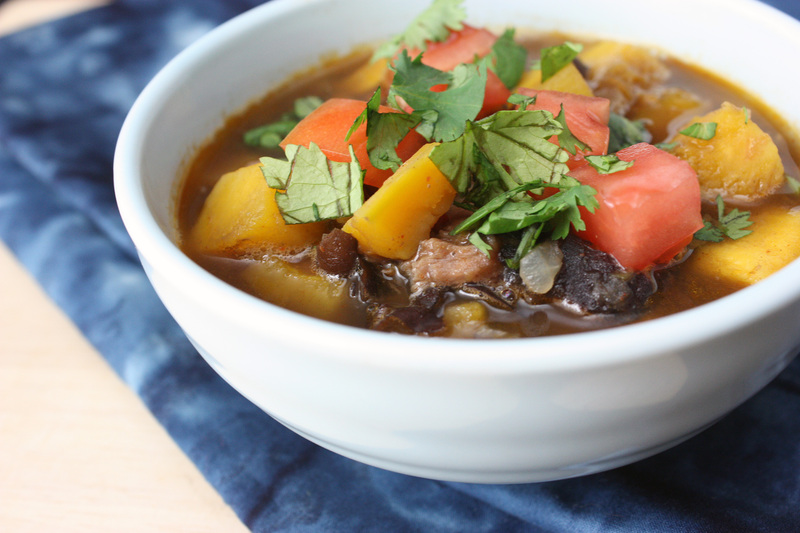 You might decide that this should become a regular meal in your rotation, especially in chilly months. (Of course, I could enjoy menudo any time of year!) For me, this is a comfort food – the warmth that the soup gives my body brings a sense of calm and happiness. Why that is, I’m not sure. I just know this is good stuff. If you’ve been shy about tripe before, give it a try in menudo. Cut it into small, manageable bits, so that you can enjoy bite-sized morsels without feeling overwhelmed. You might find that you enjoy this new nose-to-tail eating thing, and feel better for it. Menudo will cure what ails you! Place the tripe, pigs feet, onion, garlic, peppercorns, salt, oregano, and water in a large stockpot or soup pot. Bring to a boil and reduce to a simmer. Allow to simmer uncovered for about 2 hours, or until the tripe and foot are tender but not too soft. Meanwhile, remove the stems and seeds from the chiles and toast on a dry skillet for about 30 seconds or until fragrant. Pour enough water to cover, and allow to simmer at a low heat, soaking the chiles. Remove the pigs feet from the pot and set aside. When cool enough to touch, remove the fleshy parts and either tear into small pieces or chop, and return to pot. Add the hominy and Hatch chile to the pot. Remove the soaking chiles from the water and place in a blender along with the cumin. Ladle about a cup of the simmering broth from the pot into the blender, and puree until very smooth. (Add additional broth if necessary) Pour chile puree into the simmering pot and stir in. Allow to cook for about 2 hours (or more) a low simmer. Season with additional salt as necessary. Serve in large bowls, with oregano, limes, onions, cilantro, and tortillas at the table for each guest to customize their own bowl. 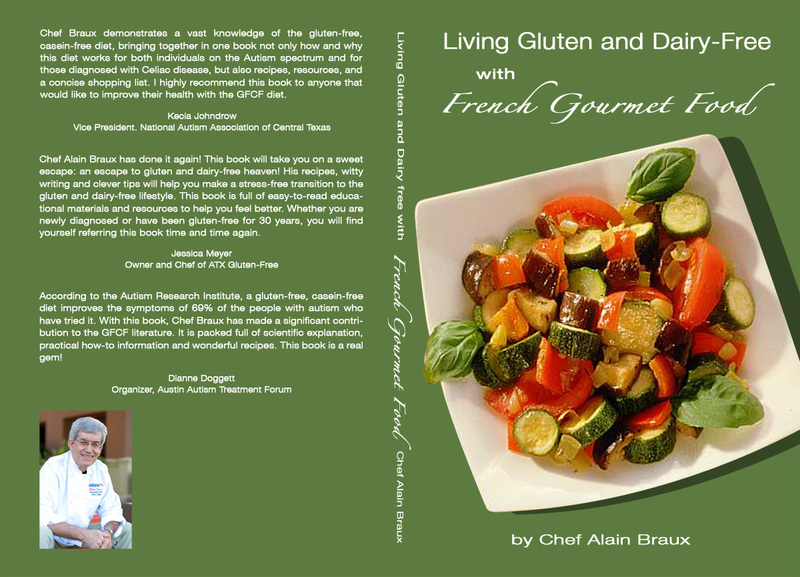 Months ago, Alain Braux, a chef and nutritherapist from nearby Austin, Texas, shared his newest book with me – Living Gluten and Dairy-Free with French Gourmet Food. Alain asked me to review his book, and so I did. It was a lengthier read than a lot of “cookbooks”, so it took me a bit of time. However, Alain is thorough. He explains the aspects of celiac disease, what it is, how to manage it, and gives a lot of details on how to travel, live healthfully, and some of the topics many books don’t cover – how to cope. Many just starting out with a gluten-free or dairy-free diet feel they have few choices – either feel deprived, or live with inferior store-bought “substitute” products. Alain explains that there is a third option, and he offers up some delicious French recipes to get you started. French recipes? (Aren’t most French recipes comprised of bread and cheese – and wine? How is this accomplished on a gluten and dairy-free diet?) Alain shows that even gluten and dairy-free French dishes can be delectable. 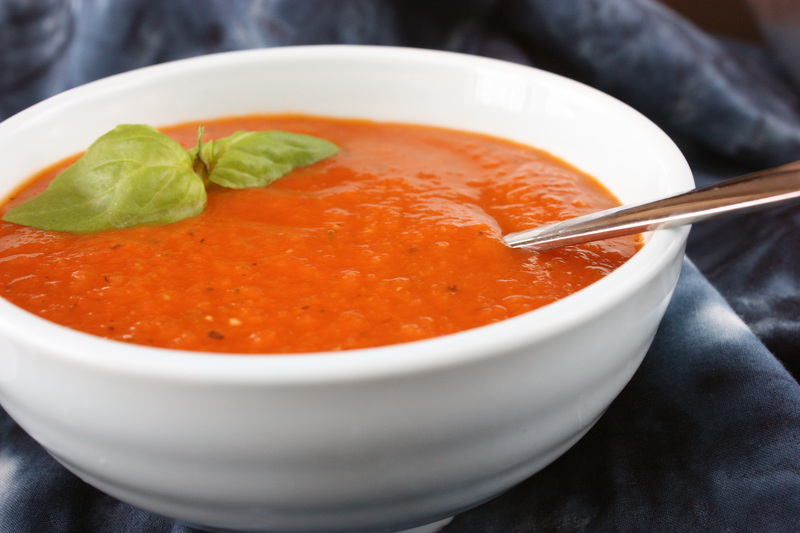 I tried several recipes, but by far, my favorite was one of the easier ones – his tomato soup. It tasted so fresh, bright, and satisfying. I enjoyed it with a slice of Ginger Lemon Girl’s vegan crusty bread for an easy vegan meal. On a chilly evening, it can’t get any better than that. In a large soup pot, saute the onions, garlic, and salt in the olive oil until golden. Clean and quarter your tomatoes. Add to the onion mix. Add sugar, basil, thyme, bay leaf, clove, and black pepper. Bring to a boil and cook at medium-low heat for about 20 minutes or until the tomatoes are tender. Process the whole soup in a food processor with a metal blade until coarse, but not pureed. Put back into the pot and add the vegetable broth to your liking, making the soup as thick or as thin as you’d like. Bring to a boil. At this point, you can enjoy the soup as is. Great hot or cold. Or you could add the thickener of your choice – rice, tapioca, or even some mashed potatoes. Just before serving, mix the finely chopped parsley and garlic with the olive oil. Stir into the soup and serve. I have always wanted to make cassoulet. 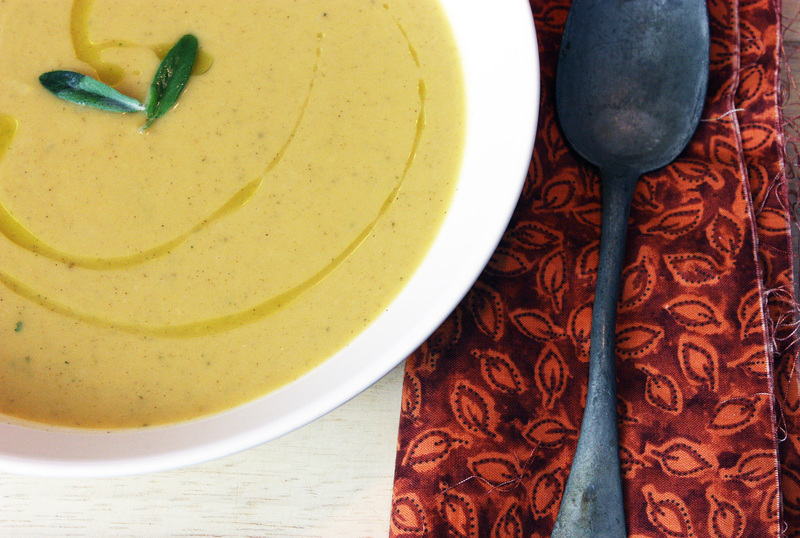 It’s rich, comforting, and perfect for a wintry day. However, lately I’ve been focusing on lighter fare. (In addition, I looked at the challenge for the first time this week, and didn’t think I could spend the time needed, or get the duck legs I wanted, in time.) So while I will definitely make the traditional cassoulet one day soon, this month, I opted for a lighter, quicker version of the dish. I opted to go for a vegan cassoulet, and confit some garlic cloves. The cassoulet came together relatively quickly. (I did opt to cook my own beans from dried, rather than canned. I used Stephanie’s slow cooker instructions, so the beans were ready when I came home from work. I think they taste better than canned, and they tend to be more digestible. An added bonus – they’re much lower in sodium.) This is one relaxing dish to make. As the aromatic vegetables cooked, the aroma was so comforting – a myriad of leeks, carrots, celery, and garlic wafted through the air. The act of slowly stirring beans in a pot soothes me – it’s not stressful, high-speed cooking. This is love in a pot. My favorite part about the dish though had to be the breadcrumbs. I will have to confess – the gluten-free bread I used was not vegan. I had frozen Udi’s to use up – so I made breadcrumbs from that bread. (Udi’s uses eggs) However, you could use Carrie’s lovely vegan gluten-free bread and make it completely vegan. These breadcrumbs were so deliciously crisp, with the inticing bite of the garlic and freshness from the parsley. I snuck spoonfuls while in the kitchen. 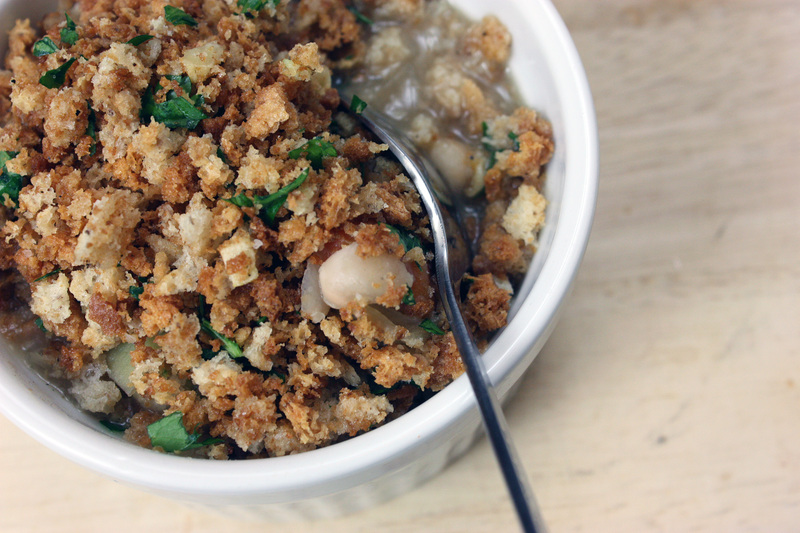 These breadcrumbs balanced the creamy beans perfectly. All in all, I didn’t miss the rich components of a traditional cassoulet (or what I’d imagine it would be, I have never actually eaten it). This was so satisfying (and healthier). I’m looking forward to the leftovers! 1. Halve leeks lengthwise and cut crosswise into 1/2-inch (13 mm) pieces, then wash well (see cooks’ note, below) and pat dry. 2. Cook leeks, carrots, celery, and garlic in oil with herb sprigs, bay leaf, cloves, and 1/2 teaspoon (2½ mm) each of salt and pepper in a large heavy pot over medium heat, stirring occasionally, until softened and golden, about 15 minutes. Stir in beans, then water, and simmer, partially covered, stirring occasionally, until carrots are tender but not falling apart, about 30 minutes. 3. Preheat oven to moderate 350°F/180°C/gas mark 4 with rack in middle. 4. Toss bread crumbs with oil, garlic, and 1/4 teaspoon (1¼ ml) each of salt and pepper in a bowl until well coated. 5. Spread in a baking pan and toast in oven, stirring once halfway through, until crisp and golden, 12 to 15 minutes. 6. Cool crumbs in pan, then return to bowl and stir in parsley. 7. Discard herb sprigs and bay leaf. Mash some of beans in pot with a potato masher or back of a spoon to thicken broth. 8. Season with salt and pepper. Just before serving, sprinkle with garlic crumbs.